Draft: 2010, New York Mets, 9th rd. Jacob Anthony deGrom graduated from Cavalry Christian Academy (FL) where he played baseball and basketball…Helped his team win the American Legion State Championship in 2006...Attended Stetson University…Played third base and shortstop his first two years before converting to a pitcher as a junior in 2010…Was 4-5 with two saves in 17 games, 12 starts as a junior…Stetson is one of two schools to have two MLB award winners in the same season (AL Cy Young Award winner Corey Kluber)...Got married two days before winning the 2014 NL Rookie of the Year...Was the guest speaker at the annual St. John's baseball dinner on January 22, 2014...Was honored by the New York Chapter of the BBWAA, along with teammates Matt Harvey, Steven Matz and Noah Syndergaard, as the "Toast of the Town" at the organization's annual dinner in Manhattan on January 23, 2016...Was honored as the 2018 New York Player of the Year by the New York Chapter of the BBWAA, at the organization's annual dinner in Manhattan on January 26, 2019. Was a near-unanimous selection for the NL Cy Young Award, finishing with 29 of 30 first place votes and 207 of a possible 210 voting points...Became the Mets' fourth winner of the award and first since R.A. Dickey in 2012...Was presented with the award during the 96th Annual New York Baseball Writers' Dinner on January 26, 2019 at the New York Hilton Midtown Hotel...Finished in fifth place in the NL MVP balloting...Received one first-place vote... Led the majors with a 1.70 ERA (41 earned runs/217.0 innings), .521 opponent OPS, 0.41 HR/9 rate, 8.8 Fangraphs WAR, 9.2 RA-9 WAR, 1.99 FIP, .277 opponent slugging, 216 ERA+, 2.08 DRA and a 1.87 road ERA...His 269 strikeouts were the second-most in the NL and fourth-most in the majors...Led the NL in home ERA (1.54), opponent OBP (.244) and Baseball-Reference WAR (10.0)...His 32 starts, 217.0 innings, 1.70 ERA, 269 strikeouts, 0.91 WHIP, 1.99 FIP, 6.3 H/9 and 0.41 HR/9 were all career-bests...The only Mets pitcher with a lower ERA in a season was Dwight Gooden (1.53 ERA in 1985)...Fanned 32.2 percent of the hitters he faced, the highest single-season rate in Mets history...Allowed three runs or fewer in each of his last 29 starts, the longest single-season streak in MLB history...Hurled 24 straight quality starts to finish the season, the longest single-season streak in major league history...Set a major league record with 19 starts in which he pitched 6.0 or more innings and allowed three or fewer runs but did not win...Courtesy of Elias...Was named to his second All-Star team (also, 2015)...Became the 13th pitcher in Mets history with multiple All-Star selections...At the All-Star break, had a 1.68 ERA, the second-lowest firsthalf mark in team history (Dwight Gooden had a slightly better 1.68 ERA in 1985)...Became the first pitcher in modern major league history (since 1900) to have a sub-2.00 ERA, at least 260 strikeouts, 50 or fewer walks and 10 or fewer home runs allowed...According to Elias, was the 10th time since 1920 that a pitcher had at least 200.0 innings and an ERA of 1.70 or lower in a season...Faced 643 batters with the score tied or the Mets up or down by one run (77 percent of his 835 total batters faced), 47 more than any pitcher in the majors...Held opponents to a .142 (19-134) batting average with RISP, second-lowest in the majors and ninthlowest since the statistic started being tracked in 1974...Opponents were 0-13 with nine strikeouts vs. deGrom with the bases loaded...Held a 1.79 ERA (29 earned runs/145.2 innings) against teams with a .500 record or better, the lowest mark in the majors (min. 100.0 innings)...With 10 strikeouts in his final start of the season, deGrom, reached 1,000 career strikeouts... Reached the milestone faster than any Mets pitcher in club history (897.2 innings, previous fastest was David Cone, who reached 1,000 Ks in 1,048.1 innings)...His 11 double-digit strikeout games was tied for third-most in the majors (second-most in NL)...Fanned at least a dozen hitters on five occasions, including a career-high-tying 13 twice (May 18 vs. Arizona and June 2 vs. Chicago-NL)...According to FanGraphs, deGrom's 26.6 percent hard-hit rate was the third-lowest in the majors... DeGrom pitched to the most soft contact in the majors (25.2 percent) among qualifying pitchers...Had a career-best 24.1 scoreless inning streak between April 21-May 18...Returned from the DL on May 13 at Philadelphia and pitched into and out of a bases-loaded jam in a 1.0-inning start that featured 45 pitches, three walks, two strikeouts and 20 foul balls...Went the distance at Philadelphia on August 18, allowing one run, unearned, in the seventh inning...Was his third career complete game...Fanned 45 and walked only five in five September starts...Became the only Met in franchise history to record at least 45 strikeouts and walk five or fewer batters in a calendar month. His 15 wins, 31 starts, 201.1 innings pitched, 239 strikeouts and 10.68 K/9 IP were all career-highs, surpassing his previous single-season highs in 2015...His 239 strikeouts were fifth-most in the majors (second-most in the NL)...His 10.68 K/9 IP, ranked third-best in the NL...Was named the National League Player of the Week for the week of June 12-18...Went 2-0 with a 0.53 ERA (one earned run/ 17.0 innings) including a complete game against the Cubs on June 12...Had 11 strikeouts on September 24 start against the Nationals...It was his 21st career double-digit strikeout game and his 11th of the season...His 11 double-digit strikeout games are the most doubledigit strikeouts games he's had in a single season and the most by a Met in a single season since Dwight Gooden had 11 such games in 1985...He ranked fourth in double-digit strikeout games in the majors behind Chris Sale (18 games), Max Scherzer (15 games) and Corey Kluber (15 games)...His 21 career double-digit strikeout games are the sixth-most in team history...He was also the first pitcher in team history to have four double-digit strikeout games among the team's first 31 games of a season...Won eight consecutive starts from June 12-July 24...During that stretch, he had a 1.61 ERA (11 earned runs/61.2 innings pitched)...Tied a single-season franchise record with his eight consecutive wins... Tom Seaver (1969), David Cone (1988) and Bobby Jones (1997) also accomplished the feat in a single season...Research courtesy of Elias...His eight-consecutive games with a win was tied for the longest streak in the majors in 2017...Clayton Kershaw won eight-consecutive games from June 7-July 18...He surpassed the 200-strikeout mark for the second time in his career...He is one of four pitchers with multiple 200-strikeout seasons in team history...Tom Seaver (1968-1976), Dwight Gooden (1984-1986, 1990) and David Cone (1988, 1990-1992) are the others...His 239 strikeouts are the ninth-most in team history in a single season...Induced 465 swings and misses on his pitches in his 31 starts, the fifth-highest total in the major leagues...Batters swung and missed 225 times at his four-seam fastball, the most in the major leagues...The swing-and-miss rate on his four-seam fastball was 14.40%, also the highest in the league (min. 1,100 total swings)...Was 12-5 following a Mets loss...The 12 such wins were tied for the most in the majors with the Marlins José Ureña...Went 6-0 with a 2.10 ERA in his first 10 career starts vs. the Phillies...The Mets were 10-0 in those 10 starts...Only Tom Seaver (13 starts from 1969-1972) went unbeaten in 10 or more consecutive starts...Hit his first major-league home run down 1-0, an opposite-field shot off the Nationals' Joe Ross, in the third inning on June 18 vs. Washington....Was called upon to pinch-hit for the 10th time in his career on September 9 vs. Cincinnati...The 10 pinch-hit appearances are the most by a starting pitcher in Mets history...Hit .211 (15-71) with one home run, one double and four RBI... His 15 hits led Mets pitchers and were the most by a Mets pitcher in a season since Mike Hampton had 20 hits in 2000... Stole his first career base in the third inning of his August 4 start against the Dodgers...It was the first stolen base by a Mets pitcher since Oliver Perez on May 11, 2008 against Cincinnati. Named to the 2015 NL All-Star team...Struck out Oakland's Stephen Vogt, Cleveland's Jason Kipnis, and Detroit's Jose Iglesias in the sixth inning of the 2015 All-Star Game in Cincinnati... DeGrom became the first player in All-Star history to strike out three batters in an inning with 10 pitches or fewer...Became the 11th pitcher in team history to record 200 strikeouts in a season…Finished fourth in the NL with a 2.54 ERA, tied for eighth in strikeouts (205), tied for seventh in wins (14) and fifth in opponents' batting average against (.215)...Since his major league debut on May 15, 2014, deGrom's 2.61 ERA (96 earned runs/331.1 innings) is the fourth-best mark in the majors (min. 250.0 IP), behind Clayton Kershaw (1.97), Jake Arrieta (2.05) and Zack Greinke (2.13)...Among major league pitchers since 1916 with at least 50 starts in their first two career seasons, deGrom has the fourth-lowest ERA...Only Dwight Gooden (2.00), Tom Seaver (2.47) and Gary Nolan (2.51) had better marks through two major league seasons... Was 9-2 with a 1.44 ERA (18 earned runs/112.2 innings) with 17 walks and 121 strikeouts over 16 starts from May 16 to August 18...Had the lowest ERA in the majors over that span (minimum 50.0 innings)...Allowed only 16 extra-base hits (six home runs, 10 doubles) to the 415 batters he faced during that stretch...According to Elias, deGrom became the first Mets pitcher with an ERA under 2.00 at least 20 starts into a season since Dwight Gooden finished the 1985 season with a 1.53 ERA...Went 6-4 with a 1.99 ERA (21 earned runs/95.0 innings) in 15 home starts...His home ERA ranked seventh in the majors...Has a 1.87 ERA (34 earned runs/163.2 innings) over 25 career home starts, the third-lowest home ERA in the major leagues over the last two seasons behind Clayton Kershaw (1.69) and Jake Arrieta (1.75) (min. 20 home starts)...His 1.87 home ERA is the third-lowest home ERA in the last 100 years for any starter in his first two major league seasons (min. 25 home starts)...Trails Dwight Gooden (1.68 ERA, 1984-85) and Mickey Haefner (1.70, 1943-44)...Had 10 starts without surrendering an extrabase hit, tied for the most such starts in the majors in 2015 and tied with Jon Matlack for the third-most in a season in club history...Named co-NL Player of the Week with Clayton Kershaw for the week of June 1-7...Went 2-0 with a 1.20 ERA (two earned runs/15.0 innings) over two starts...He allowed seven hits, issued three walks and struck out 18....Pitched at least 7.0 shutout innings and allowed two or fewer hits in a single-season franchise record five starts...No Met had ever had more than two such starts in a season...The five such starts are tied with four others for the most for any pitcher in a season since 1914...Also Chris Archer (2015), Francisco Liriano (2013), Pedro Martinez (2002) and Pete Alexander (1915)...Retired 23 straight batters after giving up a one-out single to Matt Carpenter in the first inning on May 21 vs. St. Louis...Pitched 8.0 scoreless innings, allowing one hit in that start...Also struck out a season-high 11 and walked none in that start, becoming the fourth pitcher in franchise history to allow one or fewer hits, strike out at least 10 and walk none in a game....Is 10-2 with a 1.29 ERA (17 earned runs/118.2 innings) in 18 career daytime starts...That is the best daytime ERA among qualified major league pitchers over the last two years...It is also the best daytime ERA for any pitcher in his first two major league seasons in the last 100 years (min. 100 daytime innings). • Had five double-digit strikeout performances, tied for the eighth-most in 2015 and has nine in his career, tied for the ninth-most in the majors since the start of 2014...His 5.39 K/BB ratio (205 K/38 BB) was the fourth-best single-season mark in franchise history for a qualified starting pitcher... Recorded a career-high 18.1-inning scoreless streak from April 8-April 18....Went 6-1 with a 1.39 ERA (nine earned runs/58.1 innings pitched) over eight road starts from June 1-August 18...According to Elias, the last Mets pitcher to win six games with an ERA that low over an eight-start span on the road within one season was Bob Ojeda in 1986 (6-1, 1.16 ERA)...His average fastball velocity of 94.9 miles per hour ranked seventh in the majors among qualified starting pitchers...His average slider velocity of 89.6 MPH trailed only Jake Arrieta (90.3) for the fastest among qualified major league starters....Collected a career-high and tied a franchiserecord for a pitcher with three hits on May 16 against Milwaukee, including two hits in the Mets' 10-run fourth inning...It was the 26th time a Mets pitcher recorded three hits in a game and first since Chris Young on April 5, 2011... According to Elias, Young (in that game) was also the only other Met pitcher to record two hits in an inning...DeGrom hit in three straight games from May 6-May 16, going 5-8 (.625)...Also hit in three straight from June 25-July 8 (.375, 3-8). Won each of his first three starts (Game 1 NLDS, Game 5 NLDS and Game 3 NLCS)...Was the second starter in Mets franchise history to win three consecutive postseason starts, joining Jerry Koosman who did so spanning the 1969 and 1973 postseasons....Had 29 strikeouts, the third-most in franchise history for a single postseason, trailing only Tom Seaver in 1973 (35) and Al Leiter in 2000 (31)...Won three road games, matching a Major League record for most wins on the road in a single postseason, joining Madison Bumgarner (2014), Cliff Lee (2010), Freddy Garcia (2005) and John Smoltz (1996)....Tied a postseason franchise record with 13 strikeouts in Game 1 of the NLDS at Los Angeles...Tom Seaver also struck out 13 in Game 1 of the 1973 NLCS at Cincinnati...Became the first pitcher in major league history to record six strikeouts in the first 2.0 innings of his postseason debut. Named the National League Rookie of the Year by the Baseball Writer's Association of America...Was the fifth Mets player to receive the honor...Also named the Sporting News NL Rookie of the Year and the Player's Choice NL Outstanding Rookie...Began the year with Las Vegas (AAA) of the Pacific Coast League before the Mets recalled him on May 13...Went on to make 22 starts, and win the NL Rookie Triple Crown, leading in strikeouts (144), ERA (2.69) and tying for the league lead with nine wins...The last pitcher to win his league's Rookie Triple Crown was Wade Miley with the Diamondbacks in 2012...Dwight Gooden did it with the Mets in 1984...Placed on the 15-Day Disabled List on August 11, retroactive to August 8, with tendinitis in his right rotator cuff...Returned to the rotation on August 23 in Los Angeles (NL)...Was named the NL Rookie of the Month for July and for Septemberm, becoming the second Mets player to earn the award since the award was established in 2003 (Justin Turner, May 2011)...The last pitcher to win the AL or NL Rookie of the Month twice was the Marlins' Jose Fernandez in 2013...Went 4-1 with a 1.39 ERA (five earned runs/32.1 innings) in five July starts, striking out 38 , walking seven and tying for the league lead in wins for the month...Went 2-0 with a 1.67 ERA (five earned runs/27.0 innings) in four September starts, striking out 38 and walking six...In September, ranked fourth in the NL among all pitchers with 38 strikeouts, including 23 over his final two starts. Allowed one earned run or fewer in three of his final four starts...Was co-NL Player of the Week for July 21-July 27, going 2-0 with 0.68 ERA during the period...Tied the modern-era major league record with eight consecutive strikeouts to begin his start on September 15 vs. Miami...Tied Houston's Jim Deshaies, who did it on September 23, 1986 vs. Los Angeles (NL)...The Mets record was six to begin a game, held by Pete Falcone, who did it on May 1, 1980 vs. Philadelphia...The eight consecutive strikeouts at any point are the second most in team history behind Tom Seaver's MLB-record 10 on April 22, 1970 vs. San Diego...Had four double-digit strikeout games during the season (22 games)...Struck out 10 over 6.0 innings in his final start on September 21 at Atlanta...Fanned a career-high 13 in 7.0 innings on September 15 vs. Miami...Recorded 11 strikeouts in 7.0 shutout innings on July 8 vs. Atlanta...Recorded his first double-digit strikeout outing in his fourth career start, fanning 11 in 6.1 innings at Philadelphia on May 31...Since 1990, only Hideo Nomo (9), Mark Prior (7), Kerry Wood (6), Yu Darvish (6), Masahiro Tanaka (5) and Matt Harvey (5) had more double-digit strikeout games in their first 22 games...Established a rookie franchise-record, hurling 67.1 innings from June 5-August 7 without allowing a home run...Mark Bomback held the old mark of 60.1 innings in 1980...Surrendered two home runs over his final 17 starts (109.1 innings)...Finished the season going 35.0 innings without allowing a home run, the third-longest active streak among NL starters...Went 7.0 innings and allowed one run, earned, with six strikeouts in his debut on May 15 vs. New York (AL)...The 7.0 innings tied the longest outing by a Mets pitcher in his debut since 1982, when Brent Gaff tossed 7.2 innings, losing 3-2 to San Francisco despite allowing three unearned runs on July 7, 1982...Only one other Mets pitcher who threw at least 7.0 innings in his debut took a loss...Bill Pulsipher allowed seven runs in 7.0 innings in a 7-3 defeat to Houston on June 17, 1995...The last major league pitcher to lose his debut after tossing at least 7.0 innings and allowing one run was Jimmy Haynes for Baltimore on September 13, 1995...Won his first major league game on June 21 at Miami with 7.0 shutout innings...Since 1999, the only other Mets to earn his first major league win while pitching 7.0 or more innings without allowing a run are Jae Seo (April 17, 2003 at Pittsburgh, 7.0 innings) and Jonathon Niese (September 13, 2008 vs. Atlanta, 8.0 innings)...Compiled a 1.04 ERA (four earned runs/34.2 innings) during his streak, second-lowest in the majors over that span behind Oakland's Sonny Gray, who had a 1.03 ERA (four earned runs/35.0 innings) (minimum 30.0 innings)...Gave up 25 hits while walking six and fanning 37 batters...Became the first rookie in team history to win four consecutive games in one season while pitching more than 6.0 innings and allowing no more than one run in each game...Since 1982, the only other pitchers with four-game streaks of that kind for any major league team in their rookie season are Roy Oswalt (2001 Astros), Jered Weaver (2006 Angels) and Matt Cain (2006 Giants)...Tossed a season-high 15.1 scoreless innings from July 22-August 2...Pitched 6.2 no-hit innings in his start on August 2 vs. San Francisco before Pablo Sandoval doubled...It was the third-longest no-hit bid by a rookie in franchise history...Randy Tate pitched 7.1-hitless innings against the Expos at Shea on August 4, 1975 and Dwight Gooden tossed 7.0-hitless innings at Pittsburgh on June 6, 1984...DeGrom allowed two runs in the eighth inning snapping his scoreless streak at 15.1 innings...Went 9-2 over his final 15 starts, dating to June 21...From that date through the end of the season, he ranked fifth in the majors with a 1.99 ERA, behind Clayton Kershaw (1.41), Corey Kluber (1.77), Jon Lester (1.85) and Edinson Volquez (1.85) (minimum 90.0 innings)...In 10 starts after the All-Star Break, went 6-1 with a 2.16 ERA (16 earned runs/66.2 innings)...Walked 15 and struck out 72 in those 10 starts...In his first seven major league starts, went 0-4 with a 4.39 ERA (20 earned runs/41.0 innings), allowing five home runs while walking 18 and striking out 34...Joined Tom Seaver (2.92 ERA) and Dwight Gooden (2.80 ERA) as the only Mets pitchers to have an ERA under 3.00 after 20 starts in their debut season...DeGrom had a 2.62 ERA after his first 20 starts...Went 12 straight starts issuing two or fewer walks from July 2-September 15...The streak tied for longest single-season streak of its kind by a Mets rookie since 1998 when Masato Yoshii finished the year with 12 straight starts in which he issued no more than two walks...Mets pitchers were 0-64 at the plate before he singled in his first at-bat, May 15 vs. the Yankees...The last Mets player to get a hit in his first major league at-bat was also a pitcher...Matt Harvey went 2-2 on July 26, 2012 at Arizona. Finished the season hitting .217 (10-46)...His 10 hits tied with Rick Aguilera (1985), Ron Darling (1984), Mark Bomback (1980) and Jon Matlack (1972) for third-most by a Mets rookie pitcher, behind Doc Gooden (14, 1984) and Tom Seaver (11, 1967)...DeGrom became the first pitcher in team history with a hit in each of his first three major league games. Pitched for three different farm teams during the year: St. Lucie (A) of the Florida State League, Binghamton (AA) of the Eastern League and Las Vegas (AAA) of the Pacific Coast League. In 26 combined starts, he went 7-7 with a 4.51 ERA...In 147.2 innings, he allowed 168 hits, 83 runs, 74 earned, with 46 walks and 140 strikeouts. Averaged 8.53 strikeouts per nine innings. Joined Binghamton on April 17 and was promoted to Las Vegas (AAA) on May 6. With Binghamton (AA), hurled a season-high 8.0 innings on April 17 vs. Portland and struck out a seasonbest nine on April 27 vs. Portland. Missed the entire year after undergoing Tommy John surgery. Made six starts in his professional debut with Kingsport (R) of the Appalachian League. 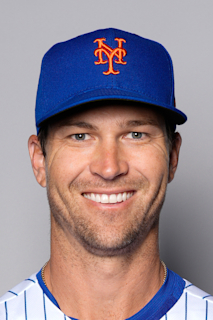 April 20, 2019 New York Mets placed RHP Jacob deGrom on the 10-day injured list retroactive to April 16, 2019. Right elbow soreness. May 13, 2018 New York Mets activated RHP Jacob deGrom from the 10-day injured list. May 6, 2018 New York Mets placed RHP Jacob deGrom on the 10-day disabled list retroactive to May 3, 2018. Hyperextended right elbow. March 30, 2017 RHP Jacob deGrom assigned to Las Vegas 51s. October 6, 2016 New York Mets activated RHP Jacob deGrom. October 5, 2016 New York Mets reassigned RHP Jacob deGrom to the minor leagues. April 23, 2016 New York Mets activated RHP Jacob deGrom. April 16, 2016 RHP Jacob deGrom roster status changed by New York Mets. August 23, 2014 New York Mets activated RHP Jacob deGrom from the 15-day disabled list. August 11, 2014 New York Mets placed RHP Jacob deGrom on the 15-day disabled list retroactive to August 8, 2014. Right rotator cuff tendinitis. May 13, 2014 New York Mets recalled RHP Jacob deGrom from Las Vegas 51s. March 14, 2014 New York Mets optioned RHP Jacob deGrom to Las Vegas 51s. November 20, 2013 New York Mets selected the contract of Jacob deGrom from Las Vegas 51s. September 24, 2013 Jacob deGrom roster status changed by Las Vegas 51s. August 29, 2013 Las Vegas 51s placed RHP Jacob deGrom on the 7-day disabled list. June 18, 2013 RHP Jacob deGrom assigned to Las Vegas 51s from Binghamton Mets. May 6, 2013 RHP Jacob deGrom assigned to Las Vegas 51s. April 16, 2013 Jacob deGrom assigned to Binghamton Mets from St. Lucie Mets. August 9, 2012 Jacob deGrom assigned to St. Lucie Mets from Savannah Sand Gnats. May 7, 2012 Jacob deGrom assigned to Savannah Sand Gnats from Kingsport Mets. April 1, 2012 Jacob deGrom assigned to Kingsport Mets. September 22, 2011 GCL Mets activated RHP Jacob deGrom from the 60-day disabled list. June 28, 2011 GCL Mets placed RHP Jacob deGrom on the 60-day disabled list. August 2, 2010 RHP Jacob deGrom assigned to GCL Mets from Kingsport Mets. June 21, 2010 Jacob deGrom assigned to Kingsport Mets from New York Mets. June 20, 2010 New York Mets signed RHP Jacob deGrom.